GP-RN: Leave or NO, YES or Remain – That Is The Question! GP-RN: Leave or NO, YES or Remain – That Is The Question!. re: Leave or NO, YES or Remain – That Is The Question! Say the words of the song: “Should I stay or should I go? … If I go, there will be trouble; And if I stay it will be double; So come on and let me know”. And now the answer, according to the Electoral Commission should not be “yes” or “no”. Instead, on the basis of research conducted for it, the Commission has decided that the answer should be “remain” or “leave”. In the view of the Commission, the government’s current proposal: “Should the United Kingdom remain a member of the European Union?”, gives the “perception of bias” and is “not balanced”. 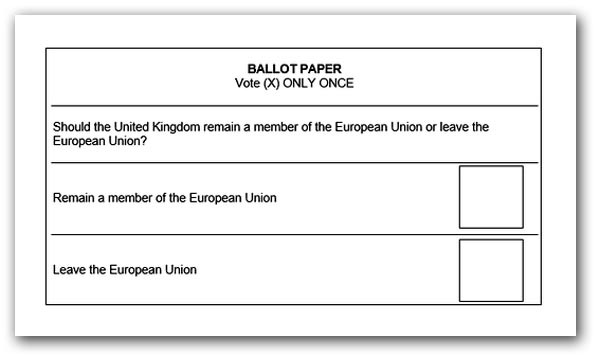 As an alternative, it is recommended that voters should be asked whether they wish to “remain a member of the European Union” or “leave the European Union”, with the ballot paper to look something like the specimen below. This was flagged up some time ago by The Boiling Frog, with the Electoral Commission having already expressed its reservations about a straight “yes-no” response. In theory, the difference with worth eight or nine points to us “leavers”, for which there is much rejoicing, even if Mr Cameron was suspiciously quick to agree to the change. But not all is necessarily what it seems. There is quite obviously a difference between perceptions expressed to polling companies before the campaign gets underway, and responses after a period of intensive campaigning. After all, the whole purpose of a campaign is to promote the “brand” and imbue it with positive associations. Arguably, an effective campaign would narrow the “yes” advantage, making the new options less attractive, especially as neither lend themselves to punchy slogans. The “leave” campaign will never convey as much force as the simple “no” proposition. Interestingly, Coventry University’s Matt Qvortrup tells the Guardian welcomes the change – but only because it would avoid a protracted debate over the question. He believes it actually doesn’t make a difference. “If you try to use leading language in a referendum question, you are actually far more likely to get a no vote, because the public is immediately suspicious”, he says – citing Charles de Gaulle’s constitutional referendum in 1969, as well as in Quebec in 1980 when the question was also massaged. The most crucial decider, Qvortrup thinks, is a unified campaign. “People respond to that, campaigns where one side is not working together do not succeed, when there is a camp within a camp”. And that, with the launch of Farage’s personalised campaign seems as far away as ever. The Ukip leader is determined to position immigration as the lead issue, wholly attributable to the EU, displaying his usual inability to master detail and ignoring the refugee convention dimension. He dismisses campaigning on an “intellectual battle” over who governs Britain, insists that immigration is “utterly central” to British voters’ concerns about the EU. However, the lack of unity and Farage’s approximation of a loose cannon, is almost certainly less of a problem than the failure to develop a coherent strategy amongst the “leavers”. The crucial point here that the initiative in this campaign remains with Mr Cameron, who has yet to reveal his hand. He seems remarkably relaxed about backing off from key commitments, apparently scrapping demands for full British exclusion from EU employment laws, and he also reported as willing to make concessions on purdah and even rules on referendum spending. This suggests a man that has abandoned his original “renegotiations” strategies and is relying on something entirely different. We are increasingly taking the view that Cameron is preparing to gamble all on “rebranding” the UK relationship with the EU, along the lines of the expected associate membership. We are convinced that the stage-managing of this ploy, at a late stage in the campaign, will drive the government’s strategy, making an apparently powerful case for continued membership of the EU. In detail, though, this will be very weak, but it will need a spirited and well-prepared counter-attack to negate the apparent advantage. That should be dominating our strategic thinking for, unless we can neutralise Mr Cameron’s “play”, we will not get the opportunity to roll out our own strategy. Against this, the precise nature of the question is small beer. In strategic terms, this fight is winnable if we come well-prepared.